I’d like to follow up on Santiago’s analysis of Les Misérables as a story, and focus on the musical and movie. 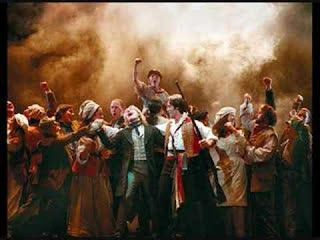 Les Mis is a musical I have loved deeply since the early 1990’s. I have basically been waiting 20 years for it to be made into a movie – they had been talking about the movie since the mid 90’s, so my screening of it was probably the highlight of my year, if not my decade. As many of you know, much of my vocation as a Jesuit Brother is rooted in a desire to bring justice to our world, to be close to the poor, to help fight against the injustices in our society and to restore right relationship with the earth. However, unlike many other people that are social justice activists, I have no personal history that inspired my desire to live justice. I was raised in a very normal middle class family that always had more than enough to survive. One may say I was rather sheltered from the injustices of our world. Over the years, my faith is what has inspired me to live justice and raise my voice against the wrongs of our world. However, the roots of my concern for justice came from this musical. I remember walking the cold lonesome streets of my quiet suburban town with Les Mis on my Walkman. Although I knew I would never experience “misery”, that I would never taste the desperation that Fantine sings about, for one short moment, I could almost experience what that profound sadness felt like as Randy Graff (playing Fantine in the Original 1985 New York Cast recording) wailed about the broken dream that lied at her feet in the cold of winter. 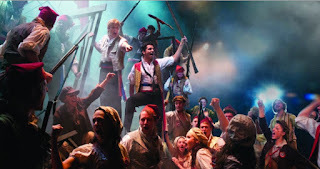 And his last words at the barricade always ring true to me, “Let others rise to take our place until the earth is free.” The rebels’ cry and the poignantly human characters have inspired and moved me deeply over the years, and they also made me overly enthusiastic about the movie! The film was nothing short of a masterpiece. I understand much of the criticism around it. Russell Crowe could simply not pull off the role of Javert. He had a few intense scenes, but he just didn’t have the right voice for the role. However, I expected that. What I didn’t expect was to be disappointed by Sasha Baron Cohen as Thenardier. The Thenardiers are supposed to be comic relief amidst all the suffering and misery. The movie version of them left me feeling uncomfortable; partly because it simply wasn’t that funny, but also because the director wanted to emphasize that the Thenardiers were not here for comic relief; they were also part of the misery. Many critics were also unhappy with the extreme close-ups of the actors’ faces. They were disturbing at times it’s true, but in my book, this enhanced the songs. The best example was Anne Hathaway’s rendition of “I Dreamed a Dream”. All in all, a half decent sung performance … but with the extreme close up of every contortion in her face, it suddenly becomes one of the most poignant renditions of it ever recorded. Perhaps what the critics had problems with is that it was too emotional! Which is probably why I love this show so much! Three cheers for the new incarnation of this old story about love, hope, faith, and life. As one of my Jesuit brothers put it, this may become one of the greatest tools of evangelization we’ve had in years! Even if he’s wrong, I’m glad the world is getting such an elaborate exposure to this classic story of human suffering and kindness!